No laptop required: "Just plug in, turn on and press record"
The ICE-16: use it with or without a computer. Allen & Heath's new ICE-16 is a 16-in/16-out USB/FireWire audio interface that, as well as hooking up to your computer, also supports multitrack recording directly to a USB hard drive. This could be useful to producers/engineers who want to be able to capture band performances in situations where having a laptop open isn't desirable (in a beery pub, for example). Check out the official details below - the ICE-16 costs £785. Allen & Heath will introduce a brand new product to its range at PLASA, the ICE-16, a 16 In/16 Out audio interface allowing performers and audio engineers to easily capture high quality multi-track recordings direct to a USB drive or interface to a computer. 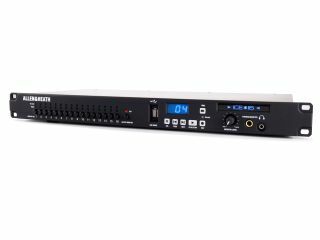 Fitted into a compact 1U rack design, ICE-16 is capable of studio quality interfacing, converting and bi-directional streaming of 16 channels over high-speed USB or FireWire at 24 bit, 96kHz resolution. Alternatively, 16 channels can be simultaneously recorded straight to a USB hard drive or memory stick at up to 24bit 48kHz resolution .wav file. The ICE-16 is expandable, so you can link units together and synchronize recording of many channels. ICE-16 connects to any audio mixer or analogue source using ¼" jacks for the inputs and RCA phono connectors for the outputs. Signal and peak metering is provided for each channel and can be switched to show input or output. Headphone monitoring is also included and switches on each channel enable checking of individual or multiple channels. ASIO drivers and Core Audio compliance ensure full compatibility with all the main DAWs, including Logic, Sonar, Cubase and Pro Tools. "I like making things simple and the ICE-16 makes life easy in many ways. Recording multitrack at a live show no longer requires booting up a laptop and configuring a session - just plug in, turn on and press record. ICE-16 is also ideal for connecting audio to your DAW in the studio, or for expanding your existing system to add channels," comments R&D designer, Mike Griffin.